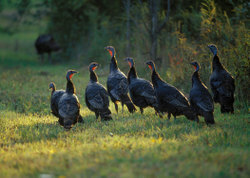 It's Turkey Season: Do You Know Where Your Flocks Are? In at least 10 states, fall turkey hunters have already taken to the field as seasons opened earlier this month. Among those, hunters in Missouri, Florida, Kentucky, Connecticut and New Hampshire are still limited to bows until the regular firearms seasons roll in sometime in October, while anything goes in Wisconsin, Montana, New Mexico, Idaho and Colorado. For most hunters, the season opening will be a mid- to late-October affair. And whether you've already started hunting or are still eagerly anticipating it, the real question is have you pinpointed those flocks you'll need to jump on for that first week's success? Hunters from Maine to Virginia are all reporting abundant young flocks, which will translate into extremely vocal and exciting hunting this season. "Everybody has been seeing turkey flocks while driving around," says Primos Hunting Calls Pro Staffer and Virginia hunter Tommy Barham. "I think it's going to be a really good season." Barham, an expert working a tube call and an avid turkey dogger, lives for the fall season to give his turkey dogs a chance to do their thing. And while things look good along the East Coast, hunters in Missouri and some surrounding states, hit by heavy rains and flooding in May as well as colder than usual weather, are concerned about flock numbers. "We had a terrible hatch this year," Missouri's top turkey biologist, Resource Scientist Jeff Beringer told Kansas City's Info Zine. He blames the poor production on the combination of cold and rain. Warm weather in March caused some hens to next early. Then freezing temperatures in April and even into May ruined the hatch. As birds attempted to re-next, the later rains then hammered them. Despite the poor outlook in the central Midwest, both Wisconsin and Minnesota news reports indicate exceptional hatches will greet hunters. That particularly good news in Wisconsin where the length of the fall season was expanded to 62 days. Regardless of whether you've already begun hunting or are just getting ready, make the time to get out there and doing a little scouting. I'll have some top tips from some of the best fall turkey chasers out there to help you in the coming weeks. Also, we'll have a review of one of the only books I've seen in recent years to focus solely on fall hunting, Fall & Winter Turkey Hunters Handbook by OL and occassional Strut Zone contributor Steve Hickoff. If you're looking to pick your game up this autumn, you'll want to read this. Word from OL contributor Steve Hickoff and others from New York north is that poults are E-V-E-R-Y-W-H-E-R-E!!!! Steve writes: Turkey hatches "here" (being Maine and New Hampshire) have ranged from late May (the earliest I saw) to the third week of July (the latest I've noted). Pretty amazing bird when all is said and done. Looks like a great season coming up. Gerry Bethge, who hunts both Mass and NY, says its unbelievable how many birds he is seeing when he is out and about on the weekends. Quaker Boy's Dave Streb echoes his observations. It's shaping up to be on phenemonal fall hunt throughout the region this year and of couple states, I believe New Hampshire, Pennsylvania and possibly even Maine (I need to confirm all of these), will allow turkey dogs for the first time. With or without dogs, if you've kept your calling and shotgunning confined to spring, this year might be the year you want to change it up. I'll let you know how things are shaping up elsewhere in the coming days. Following Steve Hickoff's successful New York hunt last week, he offered this insight into how turkey flocks are looking across the Northeast. Flocks looked good, with young-of-year groups in the upper part of the state numbering on average of 8 to 10 birds. Driving down the highways he reported that he saw plenty of flocks. Ditto for his travels through New Hampshire back up to his home state of Maine where smaller, but still plentiful flocks seem to be the norm. Gerry Bethge reports a mixed experience at his New York lease just a couple hours north of NYC, where he says flocks don't seem to be as plentiful, despite an almost successful hunt in the company of an old timer who moved at an inopportune time. This means the presence of birds probably vary widely on a very local level. Over in Massachusetts, where Bethge is soon headed, deer and bears are thick, but the turkeys seem to be hiding out as well. Meanwhile, down in Virginia where the season opens next Saturday, hunters are optimistic. Both Primos Pro Staffer Tommy Barham and turkey hunter Billy Whitman report plenty of birds roaming the fields in the southside region of the state. Unless I get blindsided by an unscheduled soccer game for my daughter, I'll be there for the opener. The boys love their turkey dogs down there and it always makes for a fun hunt when we get into flocks. Over in Missouri, Ray Eye says it's one of the weirdest years he can remember. Why? Turkeys can usually be found in the same general areas year after year. This year, however, Eye isn't finding birds in ANY of the usual places. The mystery has spurred him to hunt out new areas and seek birds out in more broken areas of terrain and smaller woodlots. He still hasn't quite figured it out from his most recent email report.